MeguiarsMirror Glaze® Clear Plastic Cleaner removes fine hairline scratches from all types of clear plastic. Unique, non-abrasive formula prepares the surface for Mirror Glaze® Clear Plastic Polish. Perfect cleaner for aircraft canopies, instrument panels, computer screens, convertible windows, helmet visors, motorcycle windscreens, displays and other clear plastic surfaces. 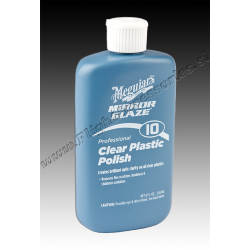 Meguiars Mirror Glaze® Clear Plastic Polish safely restores optic clarity to all clear plastics. Provides a static-free coating that repels dust. Safe and effective on both acrylic and polycarbonate surfaces. Ideal for aircraft, boats, cars, motorcycles and RV's.